Things are heating up more and more as the collaboration continues with a new hitch and Ren learns more about the depth of Kei’s plans and betrayal. 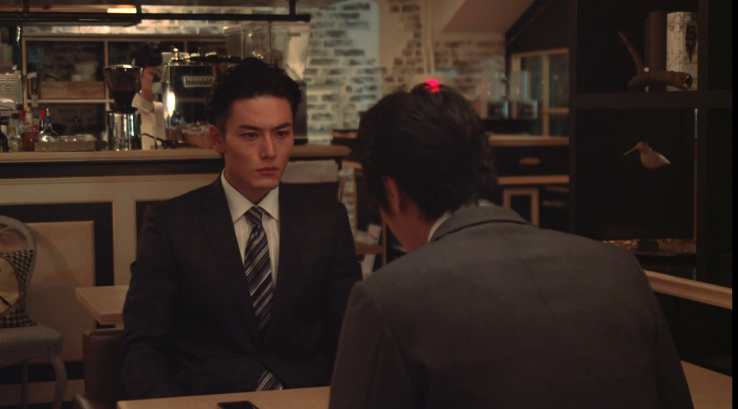 Iga meets with Ren who demands to know just what is the assistant’s connection with Hirouchi Kei. Iga tries to play dumb, but Ren is having none of it. He reveals he knows Kei had Iga follow Luna. At this time, Woo Joo enters the coffee shop and puts in his order. When he overhears Ren telling Iga to leave Luna out of this, he looks over. 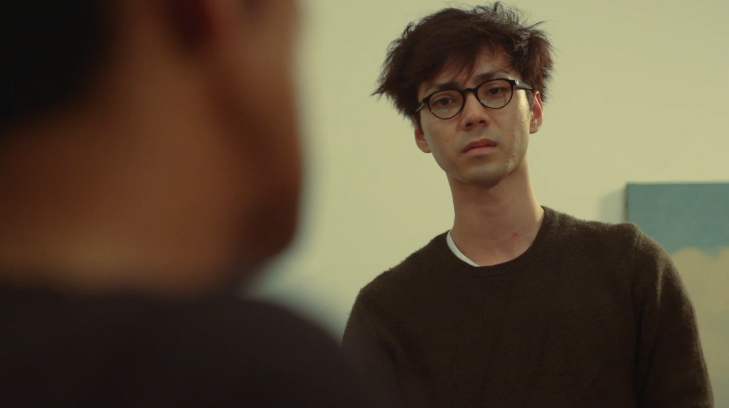 Of course, Ren’s back is to the front of the room, so he doesn’t know Woo Joo is there, but Iga notices and it makes me wonder if he’ll do anything to try to cause as much of a rift between the young men. Iga bluffs and asks why Ren is certain that the tailing order didn’t come from his father. Ren takes out his phone to call his dad and Iga quickly stops him. Kei requested this of Iga and there was no way he could refuse and of course Iga couldn’t tell Hirouchi-san what was going on. Just what does Kei want with Luna? Iga hesitates, but Ren promises to forget all the bad things he’s been doing with Kei as long as the older man fesses up. 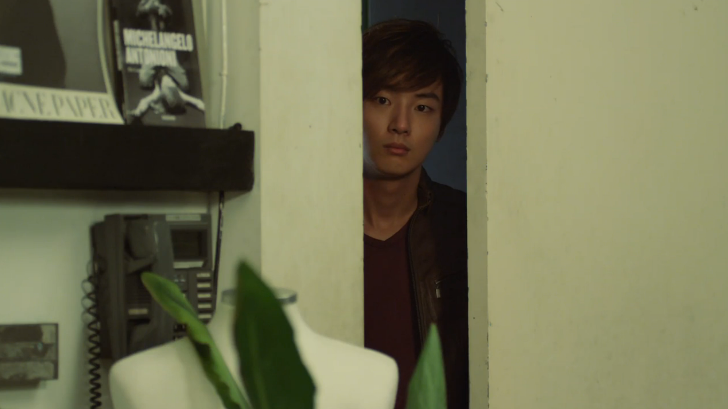 Of course, Woo Joo (waiting for his coffee) is intently listening in on the conversation from a nearby booth. Iga reveals to Ren that Kei is doing is level best to oust Ren from the line of successors (how funny as this is what Ren really wants). Iga says that Hirouchi would never allow Ren to marry Luna, thus causing strife between father and son leading to Ren’s disinheritance. If Ren does marry Luna, of course, there is no way Ren could inherit the company. Kei has had Iga watching the couple for two years now and had hoped to back them into a corner. His main goal is to oust both the president and CEO at the next board meeting with some grand scheme he’s been hatching for years. Iga apologizes for helping Kei—there was no way he could refuse him. Why? He’s the reason why the unskilled Iga could even get into the Hirouchi family’s company. 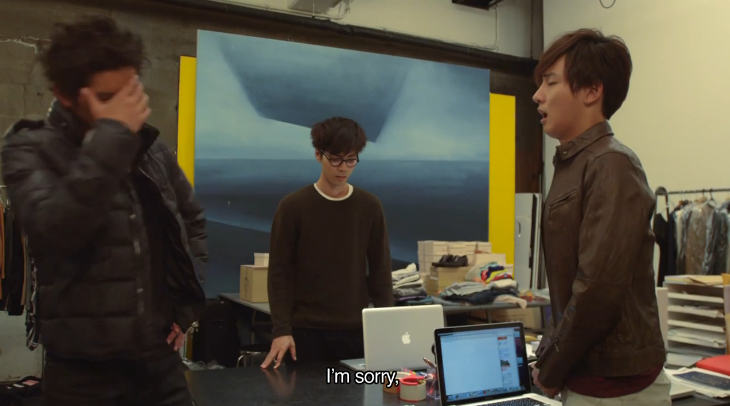 Iga apologizes while Woo Joo looks on. Ren’s had enough. He tells Iga to leave. The man quickly turns tail and runs. Woo Joo finally gets up and makes his presence known to Ren. He guesses the rich don’t have it all easy either. Money and power come with disadvantages, too. He then looks straight at Ren and tells him not to bring Luna into his family feud. Ren stands up and says that he doesn’t intend to cause any more trouble for Luna. He then leaves. A few days later, a photo shoot is going on where Woo Joo is working as the stylist. I think something bad is going to happen because the model takes off his watch and asks Woo Joo to look after it. It’s then left alone in a room. The shoot continues with Woo Joo working hard with Luna and Misaki watching on. The shoot ends without a hitch when Misaki tells Luna to check the brand’s Facebook page. Luna does and there is a message from Ren saying that “You’ve always held the key to my heart. I love you, goodbye.” Doesn’t that almost sound like a suicide message? Maybe I’ve been watching too many dramas, in which case it either means suicide or that the person is planning on disappearing. This message earns Ren his father’s wrath. What was he thinking? Wasn’t it Ren’s plan to make Pistol Star into a world famous brand? How can he do something that childish? Hirouchi then bawls out Ren for causing trouble for everyone and acting disrespectfully. Ren gets down on his knees and formerly apologizes for all that he’s done wrong. He is ready to take responsibility for the trouble he’s caused and asks to be removed from Pistol Star and brought back to the main company with a lower position and no title. Ren’s only request is his father does not cancel the brand reforms Ren has proposed since he is confident the team can do it without him. Ren’s final request is to beg his father NOT to fire Luna. 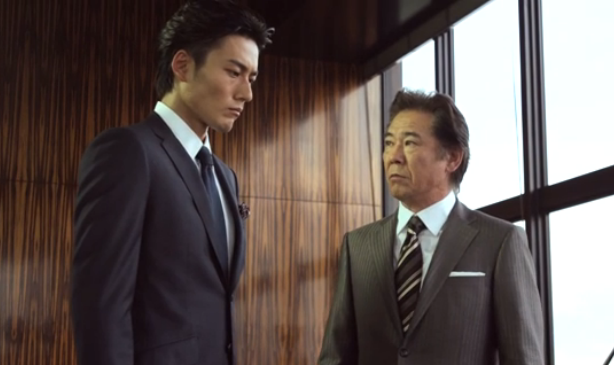 Hirouchi stares down at his kneeling son and tells him to stand up as a man’s knees should not bend so easily. Is their bad relationship finally going to mend? 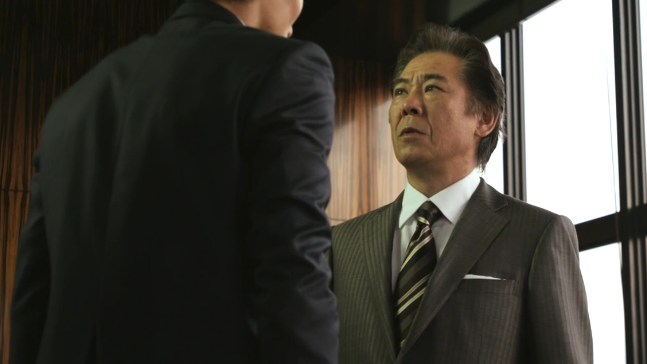 Hirouchi then asks what happened to make his son change so much. 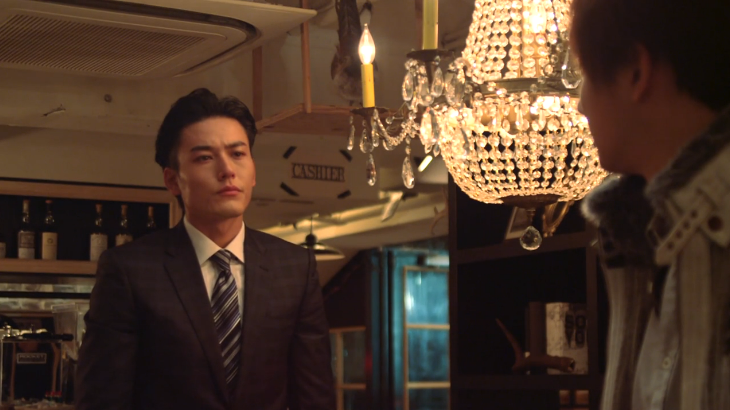 Ren stands up and tells his father about Kei’s plans to submit a double proposal to have the CEO and his father dismissed. What? Ren has even checked with all the other directors and has confirmed that Iga’s words were all true. Hirouchi demands to know who Ren heard this from. Enter Iga. He goes to excuse himself after seeing Ren and Hirouchi together, but Ren says that he heard everything from Iga. 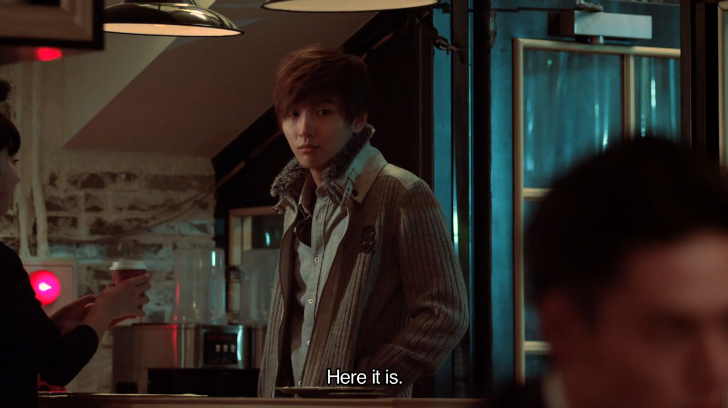 Ren then reveals that Iga was Kei’s spy. This floors Iga. Hirouchi asks if this is true. Iga quickly asserts that he was played. 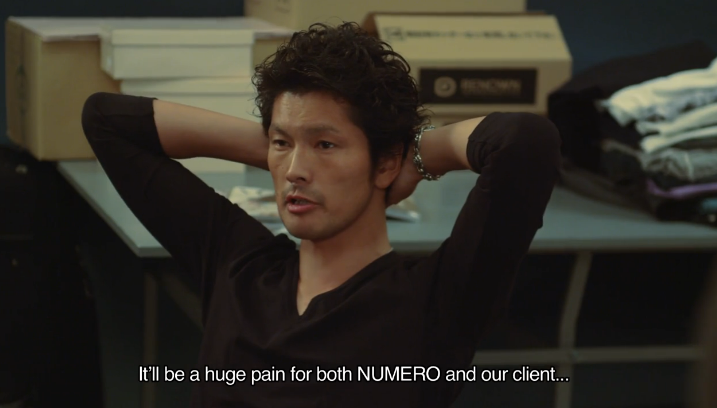 Ren then asks Hirouchi to call an emergency meeting of the board to head off Kei’s plan. 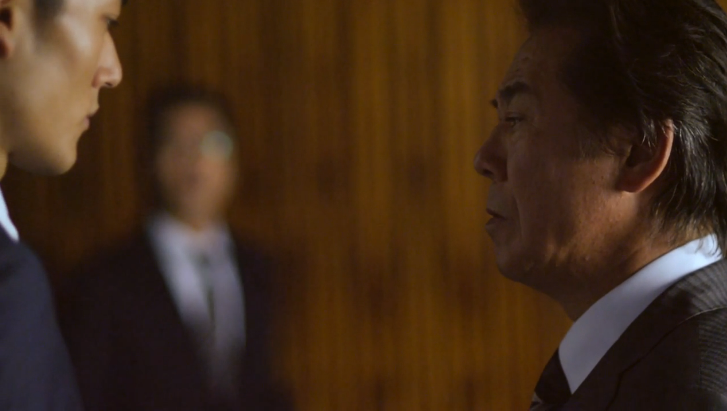 Hirouchi then tells Iga to deliver a message to Kei—to explains himself before he’s demoted and kicked out. 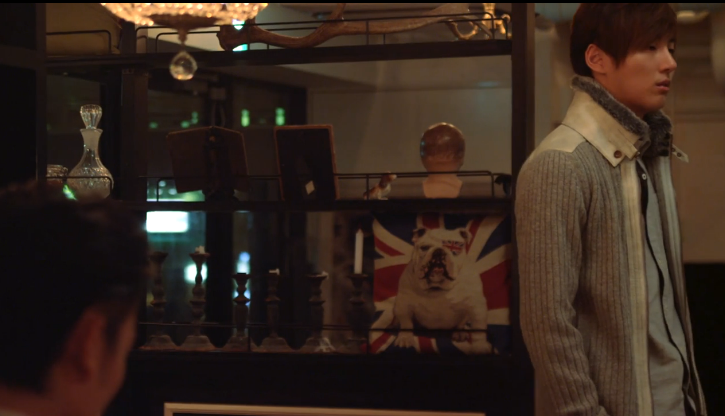 At Sakurai’s office, Woo Joo and Taka are going through clothes and checking them against their lists. Taka notices the time. Woo Joo is going to miss the last train home. Woo Joo says he wishes to finish things up, so Taka can go on ahead. At this time Luna enters and asks Taka and Woo Joo for a closing party. Taka refuses so he can make the last train home and Luna gives him beers for the road. Taka rushes out leaving the two alone. Luna apologizes for coming without calling first and Woo Joo puts her to work helping him put all the clothes in order and making sure everything is accounted for. The two work comfortably together, but awkward moments keep cropping up as they both go to speak. Luna commends Woo Joo for being a stylist when their job isn’t easy at all and Woo Joo says the same goes for Luna working as a brand publicist. They work together until they finish up with another awkward talking at the same time. This time Woo Joo brings up “that guy.” Looks like he’s impressed since Ren is taking action and responsibility. I guess Woo Joo didn’t peg him for such a guy. Woo Joo then asks if everything has called down. Luna says that thanks to Ren’s Facebook proposal, their likes and followers have exploded. Girls believe if they wear the Pistol Star brand they can marry into a wealthy family. With this latest post, comes the fear that all of that goodness can be reversed. Now that the work is done, Woo Joo and Luna sit down for their party. They break open their beers and toast each other. Woo Joo asks why Luna got into fashion. She reveals she comes from a three generation family of tailors. Being surrounded by clothes, comforts her. After her father passed away, Luna’s mother did repairs on expensive clothing to raise Luna. She then confesses she didn’t inherit any of her parents’ talents in the fashion industry. So what did she inherit? Luna reveals her father died in a car accident when she was three so she doesn’t really remember him. He died on Christmas eve in 1991 on the night of the new moon. His car skidded on ice and slid into an oncoming car. Luna and her mother were in the back seat and were unharmed, but her father wasn’t wearing a seat belt and was thrown from the car. Luna and her mother always wonder why he wasn’t wearing a seat belt. Her mother was tormenting herself about not being awake and making him wear it. Luna says since there is only 0.3% chance of getting into a car accident, you must have rotten luck. She doesn’t wish to live such a sad life. 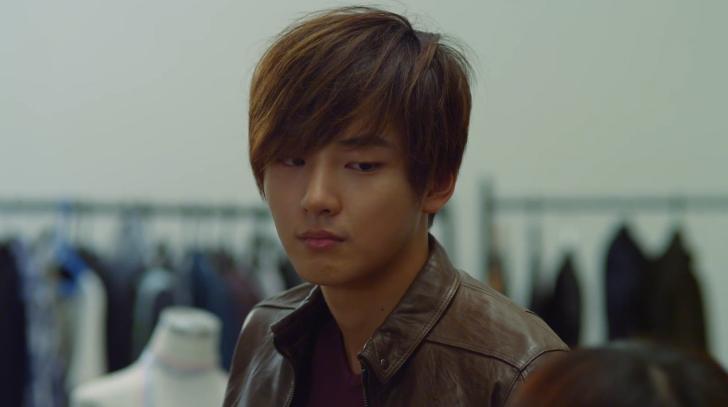 Woo Joo turns to her and says he wants her to be happy more than anyone. Luna smiles and thanks him. Doesn’t she wonder WHY he’s so pervasive in this? I would. The next day Luna gets a call from Ako that surprises her. What could it be? Sakurai goes into the office and asks Woo Joo about the model’s watch. Woo Joo said he remembers it, but he did nothing with it. Well, it’s gone missing. I KNEW it. Sen and his manager have looked everywhere at the shoot site, but it’s nowhere to be found. Does Woo Joo remember anything? Woo Joo recalls that Sen set the watch on the work table. This doesn’t make Sakurai happy at all. Woo Joo apologizes for his carelessness and Taka says that as he was cleaning up, he didn’t see a Hublot watch anywhere. I know nothing about brands, but I’m guessing it’s pretty expensive. Taka then says everything was checked over the night before and no watch was there. Sakurai tells them to recheck everything and leaves. Taka looks through their office while Woo Joo rushes off to check the studio one more time. Woo Joo desperately looks every where in the makeup room, but nothing. He heads out looking very ill. Taka wonders what is taking Woo Joo so long. What will happen if they can’t find the watch? If they can’t, Sen’s agency has demanded NUMERO replace it. They can do that, but the ad may be suspended because of the scandal. Plus, Sakurai was told to fire the assistant that lost the watch. Woo Joo arrives outside in time to hear these words. Taka stands up. That’s too much. Why should he be fired? Sakurai assures him he has no intention of firing Woo Joo, so Taka needs to watch what he says. In the worse case scenario, they could lose a lot of money and have to reshoot everything. Poor Woo Joo. We end the episode with Wooo Joo overlooking the water and recalling all that Sakurai said. The poor boy just can’t catch a break. He’s worked too hard to be drug down by this. He’ll persevere. You know he will.